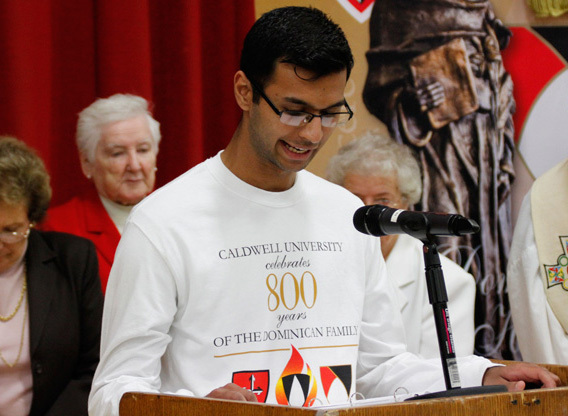 Caldwell University kicked off its celebration of the 800th Jubilee of the Order of Preachers on Nov. 11. Students, staff, faculty, alumni, special guests and the Sisters of St. Dominic of Caldwell, the order that founded the university, gathered to mark the occasion with Mass and a luncheon. Sister Patrice Werner, OP, prioress of the Sisters of St. Dominic of Caldwell, greeted those in attendance and explained how the Jubilee Year opened formally on Nov. 7, the Feast of All Saints of the Dominican Order, and will end on Jan. 21, 2017, because the 21st was the day on which Dominic received official confirmation of the Order from Pope Honorius III. “The Jubilee is a celebration of the entire Dominican Family—friars, nuns, sisters, lay members, laity,” she said.